These sparkling soaps will be the perfect addition to your perfect day! The white window soap boxes will complete the packaging. INCI Ingredient Label: Sorbitol, Propylene Glycol, Water, Sodium Stearate, Sodium Laureth Sulfate, Sodium Myristate, Sodium Cocoyl Isethionate, Glycerin, Triethanolamine. Titanium Dioxide, Fragrance, Ultramarines, Diazolidinyl Urea, Methylparaben, EDTA, Benzophenone 4. Weigh 20 oz. of the Basic White MP Soap Base. Cut up into chunks and place in large glass bowl. Heat in microwave at 30 second intervals until the soap is melted. Add .5 oz. of fragrance oil and mix well. Place Rectangle Soap Mold on a cookie sheet. This will help stabilize the mold should it need to be moved. Pour melted soap into all 4 cavities. Spritz the top of the soap with alcohol to dissolve any surface air bubbles. Set aside and allow soap to solidify. 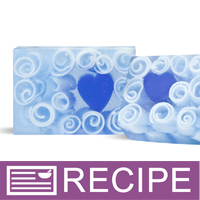 Once soap is hardened, unmold white rectangle soap base and create soap curls. You can use a potato peeler to get large curls or a cheese grater to get white shavings. Or, make a little of both. Set soap curls aside until Step 20. Weigh and cup up 8 oz. of Crystal Clear MP Soap. Place in glass measuring cup and heat in microwave at 30 second intervals until all soap is melted. Add .5 oz. of fragrance and mix in well. Add 1.5 ml Matte Cobalt Blue Liquid Pigment to melted soap and stir well to mix in. Place heart tube soap mold on a cookie sheet. This will give the mold stability should it need to be moved. Pour blue soap into 4 of the small heart tubes. Spritz the tops of the soaps with alcohol and allow soap to harden. Once soap has hardened, unmold blue heart tubes and cut each tube into thirds. Each piece should be about 1 1/4 inch long. Set aside until Step 19. Weigh and cut up 20 oz. of Crystal Clear MP Soap Base. Place in glass measuring cup and heat in microwave at 30 second intervals until all soap has melted. Add .5 oz. of fragrance oil and mix in. Add about 10 drops of Matte Cobalt Blue Liquid pigment to give the clear soap a bluish tint. This will make the white curls pop in the soap. Add desired amount of Iridescent Sparkle Glitter to the melted soap and stir in. Allow soap to cool down to about 125° F before pouring. If too hot, it will melt the white soap curls. Place Rectangle Soap Mold on a cookie sheet. This makes it easier to move the mold without disturbing the soap. Place one blue heart tube in each cavity of the Rectangle Mold. Be sure to place the heart so that it can be seen through the window of the soap box. Fill the remaining area of the soap cavity with the white soap curls/shavings made earlier. Heavily spritz each cavity with alcohol to ensure the the clear soap adheres to all of the soap curls. Once soap has cooled to 125° F, pour clear glitter soap over the white curls in each of the four cavities. Spritz top of each cavity with alcohol to pop any surface bubbles. Set aside and allow soap to harden. Repeat Steps 14-23 until all 12 soap bars have been made. Package as desired and enjoy. We recommend wrapping tightly with plastic wrap then placing in white soap boxes.